Salon.io is a web-based application made for photographers, artists and designers that allows you to easily create beautiful websites, image galleries and portfolios without any coding knowledge using an entirely drag & drop interface. At the same time we offer complete control over your code for those that want it. Using our intelligent code editor you can edit your pages with any CSS, HTML or JS and see how it affects your page instantly. To see what our users have made using Salon.io take a look at our gallery page. How can I contact Salon.io? © Does Salon.io take any ownership or copyright over my images / contents ? No, absolutely not! Your work is your work and uploading it to Salon.io doesn't change that. The only time we use our users' images is to promote them through our social networks and we always ask their permission beforehand. How do I get my images on the front page? In regards to format we support .jpg, .png & .gif. Animated .gifs are also rendered properly! There is a size restriction on uploads of 5MB per file. In regards to content we have no specific rules but obviously nothing illegal & do not pass off others' work as your own. What platforms does Salon.io support? We currently support Chrome, Firefox, Safari, Opera & IE on Windows, Mac OS & Linux. As well as this we have a custom interface for use on iPad. The site does also function on mobile browsers. Can I add custom HTML or CSS? You most definitely can! If code editing is your bag Salon.io offers an intelligent code editor where you can apply page specific or global custom CSS, HTML and even JS. It all renders immediately so you can see the effect your code has on your page without needing to save or reload. Note: You need a paid account in order to be able to do that. Get one at a reduced pricewhile we're still in beta! 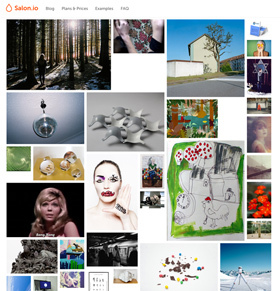 By default, when a visitor clicks one of your images they are taken to 'slideshow view'. Here they can see an enlarged version of the image and move through other images on that page using on-screen arrows or the arrows on their keyboard. You can change this behavior by clicking the edit button on the image and setting the link to something else (or nothing at all). How does it look on the iPad? Salon.io works well on the iPad. We'll add swipe gestures for the slideshow mode soon! Can other people move my images around? Only if you allow it! In the side menu you'll find the option "Allow asset dragging for visitors". Can I setup a custom domain? Of course! You can link your own domain with your Salon.io profile in minutes. You need a paid account in order to be able to do that. Get one at a reduced price while we're still in beta! Here's an easy three step-guide. If you haven't yet purchased a domain consider using iwantmyname.com as they offer one click setup with Salon.io so you don't have to muck about with IP Addresses and A NAME records. Alternatively, to find an in depth guide to setting up a custom domain on Salon.io click here. Can I track who visits my site? We use Google Analytics on Salon.io and intergrating it into your site is simple. Just sign up for an account here. Then copy your tracking code into your site settings on Salon.io. Note that you must have a custom domain enabled in order for this to function. Can I stop people from downloading my images? Their technology adds a digital near-invisible watermark to your images. This watermark is then watched for online by their software and you are notified if it is ever found. When you upload an image to Salon.io we automatically generate differently sized versions so that when you change the width of the image on your site it only has to load the size specified thereby optimising load times and file sizes. Salon.io is developed as a Single Page Web App (using Backbone.js) - a novel architectural style that lets developers write interactive websites in a more integrated and efficient way. Users benefit from faster loading times and a snappier interface as bandwidth and server requests are noticeably reduced. Are there any adverts on Salon.io? Salon.io is and always will be an ad-free platform. Even on free accounts we'll never display annoying clutter. The only item we do place on free & basic accounts is a small (15px wide) drop logo that links to our homepage). How do I create a QR code for my site? Creating a QR Code (2D Barcode) is easy thanks to Google's URL shortening service. Simply go to goo.gl and enter the link to your site. 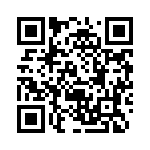 Then google will give you a shortened URL - copy this into the address bar and add '.qr' to the end of the link. Hit enter and Google will generate a QR code which you can save to your computer and use whever you need it! For a more in-depth guide visit our page here or scan the QR code below! How are subscription accounts billed? Yearly billed subscription accounts begin on the day of purchase and run until that date the next year. They are automatically re-billed but can be cancelled at any point up to the rebilling. I'm a premium user but I still have the Salon.io branding in the top right how do I remove it? the branding only shows up when you access your site via salon.io/username the drop branding is disabled only when you access your site via your custom domain eg. yourdomain.com. Why can't I see my footer? Your footer text is only displayed on your Overview page currently. We're working on additional options for how and where to display your footer.